Why Are These People In My Family Photo? I have inherited a lot of family photos. There are mysteries in some of them, as it’s not immediately obvious why there are seemingly unrelated people in many of them. This particular photo is from a box of photos that were given to my mother in about 1961 or early 1962 by her grandmother, Tensie Humphrey (born Hortense White). They had been stored in an outbuilding, and some of them were damaged by the dampness. In the early 1970s, my mother gave them to me. In the early 1980s, I took them to my grandmother to see if she could help me identify them. She was able to identify all but two of the people in the above photo. The first person in the photo to catch my eye was John Cannon. This is where my research story is a little out of order, as I was actually searching for something else and came upon the Cannon name. On another of my sites, I had written about another mystery photo of Daisy Pittman. She was married to Bryant Hatsell. I was researching the Hatsell/Hatchell name this week on Ancestry, and one of the search results was a Cannon family. That reminded me of the above photo, so I looked through the Cannon family tree. I found John Cannon in that tree. 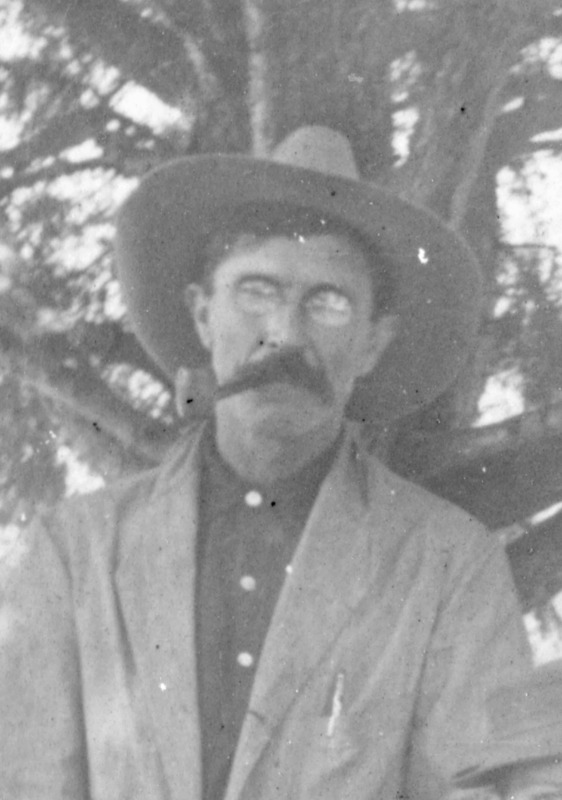 He was the son of Thomas B. Cannon, and was the grandson of John Cannon and Susan Hatchell. 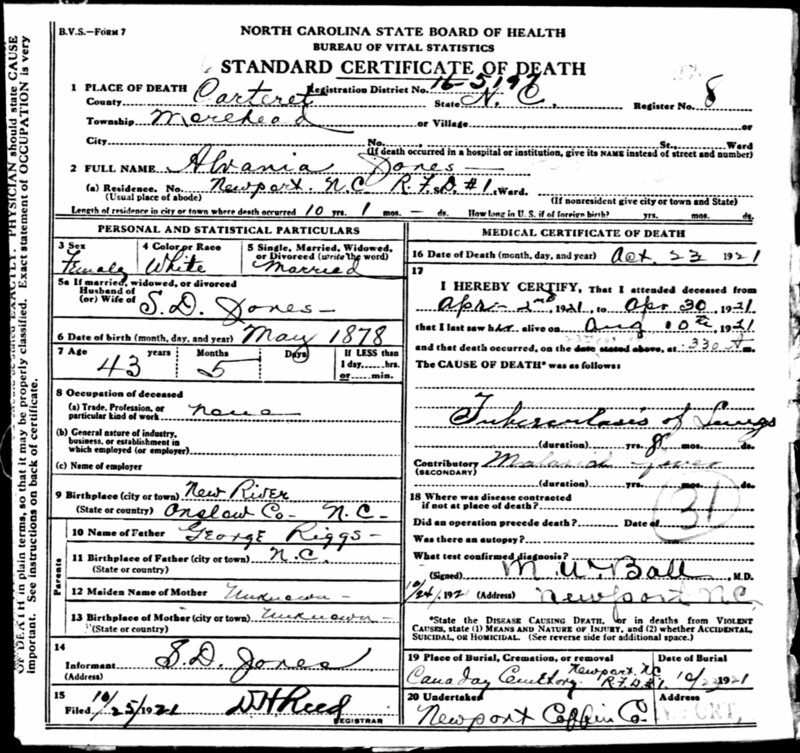 He was born September 18, 1870 in Carteret Co., NC and died March 29, 1943 in Morehead City, Carteret Co., NC. When I was going through the Cannon tree, I found a Charlotte Cannon who had married Isaac Simpson. Isaac Simpson had also married, as his 2nd wife, Charlotte Hatsell. Isaac Simpson and Charlotte Hatsell were the parents of Mack McClain Simpson. Mack was married to Pearlie Mae White, sister of my great-grandmother, Hortense “Tensie” White, who is in the above photo. In the 1910 and 1920 Census, John Cannon was a neighbor of Uncle Mack and Aunt Pearlie in Newport. My great-grandmother had probably gone there to visit, and the neighbors came over to visit as well. Next, I tried to find out who the Joneses were and if they were related somehow. Since Dink was identified only by his nickname, I started researching Alvina, who seemed to be his wife. 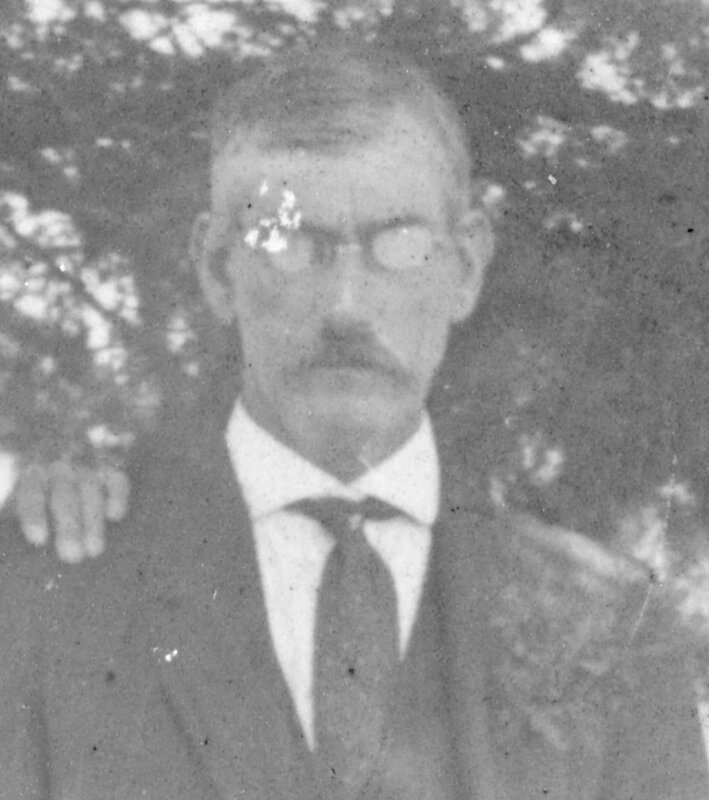 I found Alvania Riggs married to Stephen D. Jones in 1913, around the time of the photo. I noticed that Stephen D. Jones also was a neighbor of Uncle Mack and Aunt Pearlie in Newport. Then I found Alvania’s death certificate. Alvania’s father was listed as George Riggs. I searched again for Alvania after getting her birth and death dates, and found that her parents were George Noah Riggs and Missouri Elizabeth Littleton. 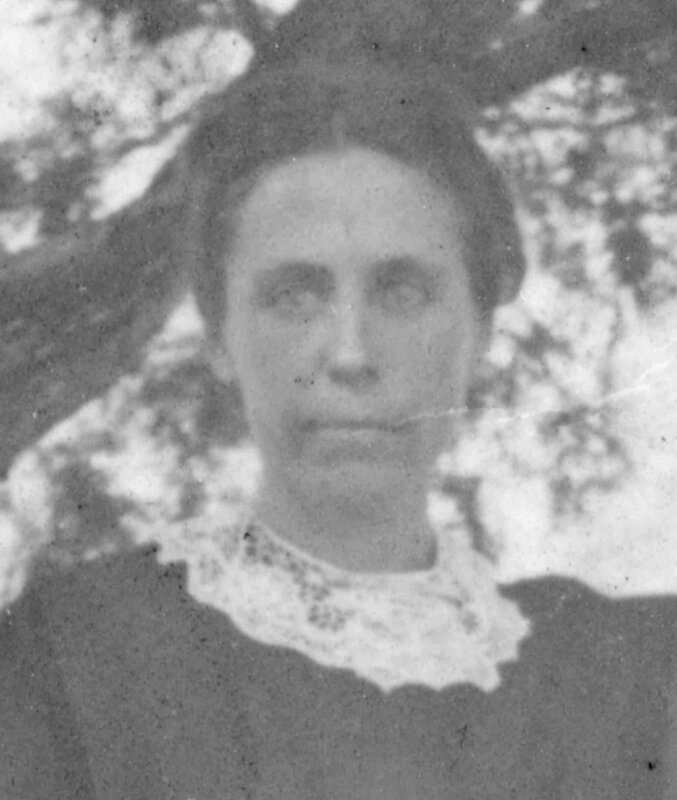 I also found that George Noah Riggs was the same person who later married Mary Elizabeth White, another sister of my great-grandmother, Hortense “Tensie” White. The genealogy I found on Alvania gave her husband’s full name as Stephen Durham Jones. It also gave his 1st wife’s name as Laura Simpson and listed their children. Two of those children were Carroll Jones and Cannie Mae Jones. Further research gave me Carroll’s full name as Cecil Carroll Jones. Here is a chart to show the connections. The names of the nine known people in the photo are highlighted. 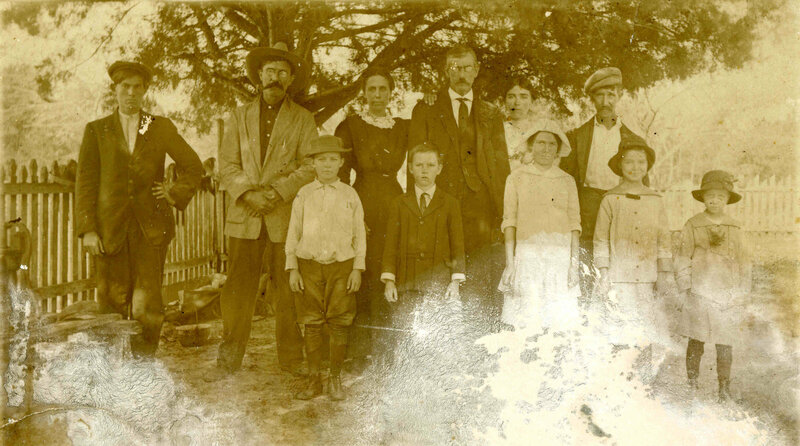 The central figure in the photo was my great-grandmother. Everyone else in the photo was connected either directly to her, or indirectly to her through her sisters. That solves the mystery, except for the names of the two unidentified young gentlemen. I have a baby photo in my collection which I now believe is from the batch of photos formerly owned by my grandfather, Guy Raymond Summerell. 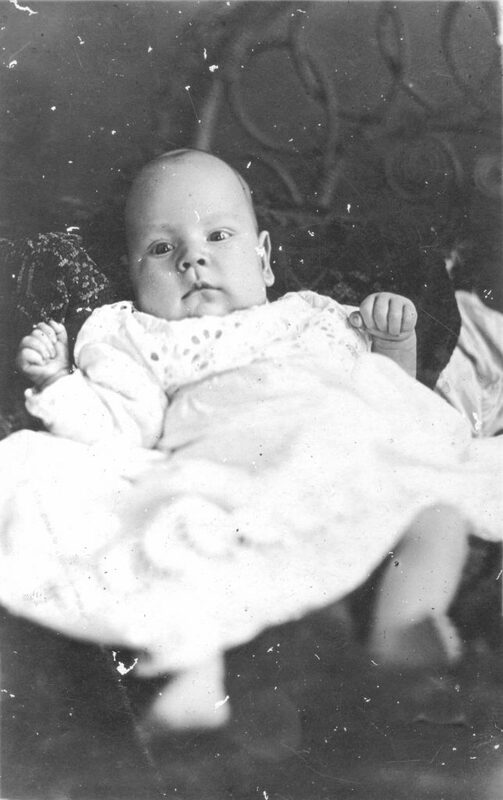 The photo is labeled “Raymond Cuthrell.” I didn’t know of any Cuthrells in the family, so I did some research to see who he is and why I have his baby photo. Raymond Edward Cuthrell was born on January 19, 1932 in Norfolk, VA and died June 1, 2007 in Coral Gables, Dade Co., FL. His father was Julian M. Cuthrell and Virginia Mae Mann. There are a lot of Manns in eastern NC, so I decided to start my research with Virginia. 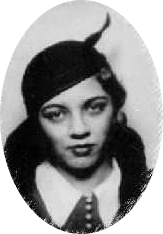 Virginia Mae Mann had a short life that seemed troubled. She was born on March 14, 1914 in Norfolk Co., VA to Marion Spencer Mann and Bessie Mae Williams. When she was 17, she married Julian M. Cuthrell on October 14, 1931 in Camden Co., NC. Then she had her son Raymond three months later on January 1, 1932 in Norfolk, VA. Then nine months after that, she married Paul Everett Lennox on October 20, 1932 in Norfolk, VA. I cannot find a divorce for Cuthrell, even though he lived until 1976. Just two years later, she turned on the gas in the kitchen and died October 10, 1934 in Norfolk, VA. 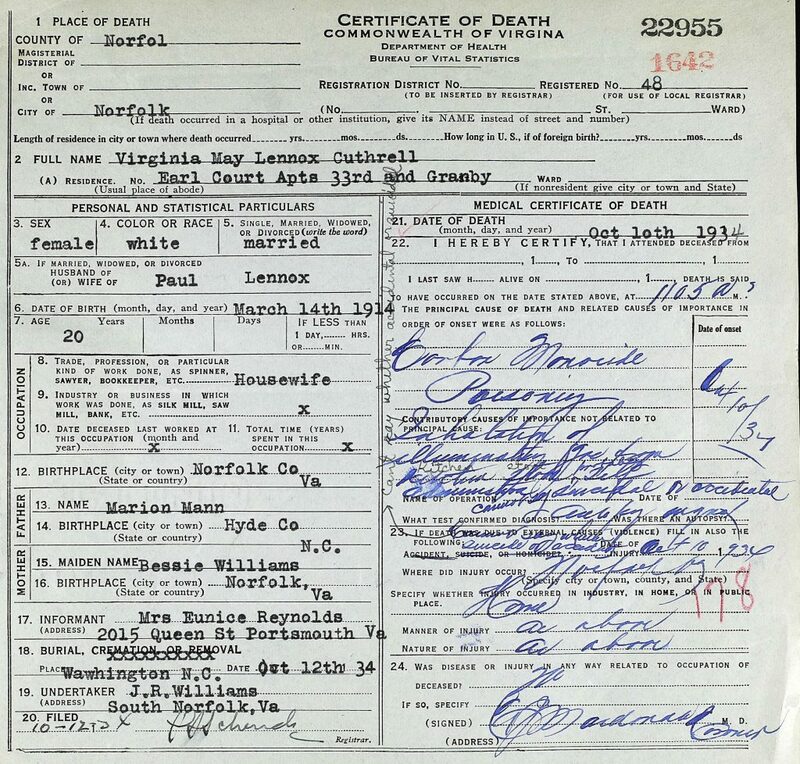 Her death certificate gives her name as Virginia May Lennox Cuthrell, even though it gives her current husband as Lennox. It says her death was either accidental or suicidal. She was buried October 12, 1934 at Oakdale Cemetery, Washington, Beaufort Co., NC. Her tombstone gives her name as Virginia Mann Cuthrell. This leads me to believe that there was some problem with her second husband. 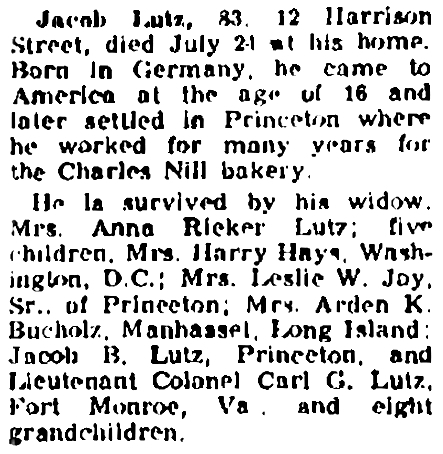 Since I haven’t seen the second husband in online genealogies, it may be that the rest of the family didn’t know about him, and they may not have known all the information that appeared on the death certificate. Virginia’s parents took Raymond to raise, as he is with his Mann grandparents in the 1940 Census in Beaufort Co., NC. 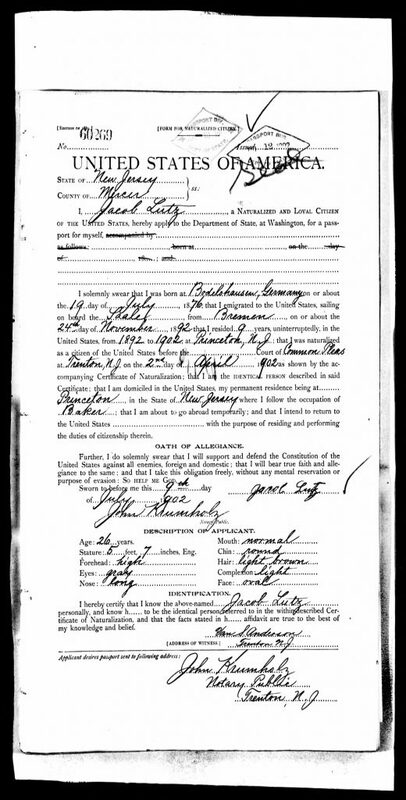 The next notice of him is the social security record of him getting his social security card in January of 1945, when he was 13 and probably starting to work. In 1995, he changed his name to Ray Edward Cuthrell on the social security records. He also got a delayed birth certificate in Norfolk, VA and gave his birth date as January 20, 1932, even though it is January 19, 1932 everywhere else. He also gave his name as Ray Edward Cuthrell. I went to the Marion Spencer Mann family to see if there was a connection with any of his ancestors or descendants. I looked at one of the family trees on Ancestry and found that one of his daughters, Elsie Blanche Mann, was married to James Albert Smith. There are a lot of Smiths related to my grandfather, as both of his grandmothers were Smiths and were sisters. I checked out James Albert Smith’s ancestry and found that his grandmother was a Summerell. So there was a connection. 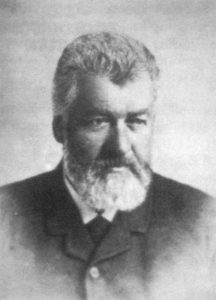 James Albert Smith’s father was James Edgar Smith, and his grandparents were Bryant Dawson Smith and Louisa Frances Summerell. The next thing was to find out how Louisa Frances Summerell was related to my grandfather. The only online tree that listed a father for her said that his name was Blaney Sumrell. I did a thorough search and found that there was no one by that name old enough to be her father. As I was looking at trees that had her listed, I found one that had a link to her marriage record. Luckily, the record had the parents of both the bride and groom listed. It listed her father as Lemuel Summerell and her mother as Melvina, and it also gave her age, which indicated a birth year of approximately 1853. I looked in my own tree and found Lemuel and Melvina. I also found that I had a daughter for them listed as L. F. Summerell, born about 1854. So here was Louisa Frances Summerell and the final link between Raymond Cuthrell and me. Raymond Cuthrell’s uncle, James Albert Smith, was my 3rd cousin, once removed, as you can see in the chart below. Genealogists are familiar with the problems that come with the Smith and Jones surnames. They have different types of origins, but are similar in the problem of overabundance of unrelated families. Smith is an occupational surname, so many men who were blacksmiths chose Smith for their last name, or had it chosen for them by the record keepers. Jones originated with the first name John. When it was dictated by the King of England that the Welsh choose surnames, many of them used forms of their fathers’ first name. For example, if their father was named Richard, they chose Ap Richard, meaning “son of Richard,” which later became Pritchard. Other surnames came in a similar manner, such as Powell and Price. Many people had a father named John. Most of those got the surname Jones. So you can see how we came to have so many unrelated Jones families. You can have two Smith neighbors who have no kinship whatsoever. I saw this firsthand when I was growing up, as there were neighboring Smith households down the road who, as far as they knew, were not related at all. Over 40 years ago, I came upon this problem in my own ancestry. My great-grandmother was Lucretia Jones. Her parents, according to her death certificate, were Wiley Jones and Nancy Smith. So I had both problem surnames in one family. I have only recently been able to get anywhere with them. There are many genealogies online now for Wiley Jones. They almost all say that he was born July 22, 1819 in Craven Co., NC and died December 12, 1897 in Pitt Co., NC. They also say that he married Marina Smith or Marina Ange and had about six children. My own genealogy says that Wiley Jones married Nancy Smith. There are also many genealogies online which say that Nancy Smith was married to Redding L. Jones. There are contradictions and inconsistencies in the genealogies when compared with the available records. I have studied these and have come to the conclusion that most of the online genealogies are incorrect. The first fact to note is that my great-grandmother, Lucretia Jones, was born April 14, 1857, to Wiley Jones and Nancy Smith. A supporting fact is that Wiley Jones (shown as Willie Jones) is in the 1850 Census for Pitt Co., NC with a wife named Nancy. They have one child, Laney, who is 8 months old. This means that Wiley probably married Nancy around 1848. As Lucretia was born in 1857, Wiley was still married to Nancy at least until then. The 1860 Census for Pitt Co., NC shows “Wilie Jones” and wife, “Mariny,” with three children, Selina (age 6), W. A. (a boy, age 5), and S. A. (a girl, age 2). 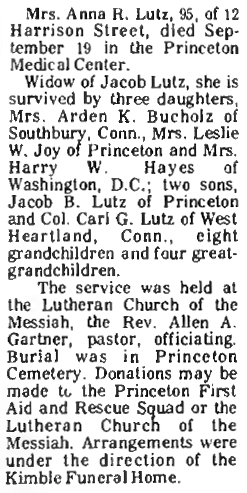 Later records show that the last two children were William Augustus Jones and Sophia A. Jones. All of the online genealogies say that Marina is the mother of those three children. If Wiley was still married to Nancy in 1857, the first two children obviously would have to be hers, not Marina’s. Further confirmation of this came when I found the marriage record of Selina. On that record, she states that her mother was Nancy. Another question is about the Nancy Smith who married Redding L. Jones. When you look at the 1850 Census for Pitt Co., NC, you see Wiley Jones and his wife, Nancy (who we know was a Smith). In the preceding household in the Census, you see Willie Smith and his daughter, another Nancy Smith, who happens to be same age as Redding’s wife as shown in the 1860 Census. So there were two Nancy Smiths. So here is what I conclude about Wiley Jones, his wives, and their children. Wiley was first married in about 1848 to Nancy Smith. She was born about 1828 and died in 1857, probably from childbirth. They had four children, Laney (b.c. 1849), Selina (b.c. 1854), William Augustus (b.c. 1855), and Lucretia “Lou” (b. 1857). Wiley then married Marina Smith, who was born about 1831. They had four children as well, Sophia A. (b.c. 1858), Asa Warren (b. 1861), Sepepta (b.c. 1867), and Lousetta (b. 1869). Marina’s maiden name was Ange, as she was married previously to William Augustus Smith, who died in 1852. 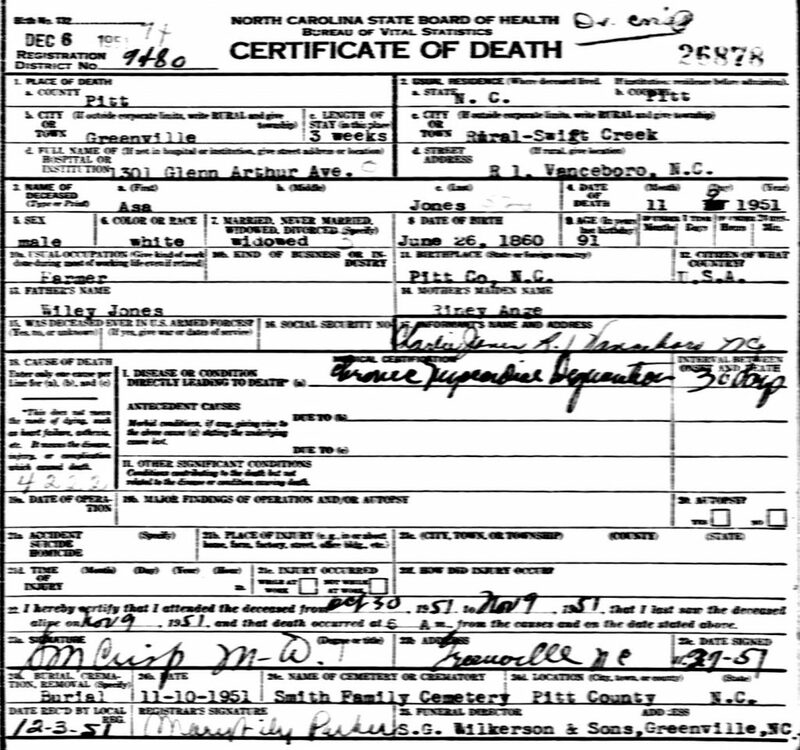 I didn’t have good evidence of which Marina Smith had married Wiley until I found their son, Asa’s, death certificate. Wiley’s family group data is here. 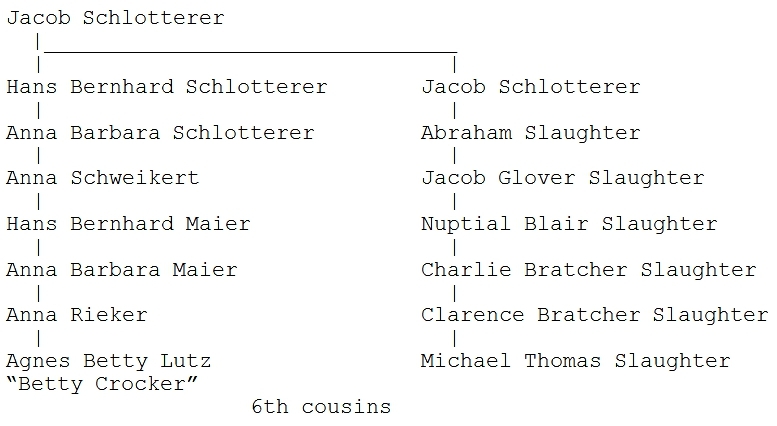 A chart of Wiley’s descendants is here. I have also found Wiley’s supposed ancestry. I had started adding it to my data, but I have stopped because there are too many problems with all of the online genealogies. I will write more about Wiley’s family when I find more data and can figure out the truth. 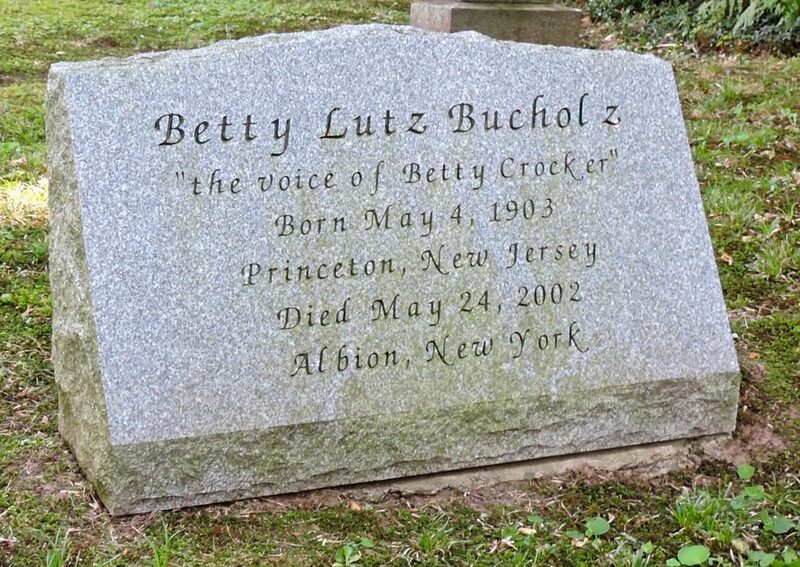 Here’s some additional information on the Betty Crocker radio show, which starred Betty L. Bucholz. According to The New, Revised Ultimate History of Network Radio Programming and Guide to ALL Circulating Shows, by Jay Hickerson, 1996, p. 42, “Betty Crocker” was a 15-minute mid-day show on the air from 1926 to 11-6-1953. From 1926 to 5-29-1936, the show aired on Wednesdays and Fridays on NBC. From 6-3-1936 to 5-27-1937, the show aired on Wednesdays and Fridays at 1:15 PM on CBS. From 6-1-1937 to 3-28-1941, the show aired on Wednesdays and Fridays at 10:45 AM on NBC. From 4-2-1941 to 8-1-1941, the show aired on Wednesdays and Fridays at 9:45 AM on CBS. From 10-1-1941 until the show’s end, 11-6-1953, it aired on various days on CBS. At the time the book was written in 1996, there were recordings of only three episodes in circulation, 8-10-1945, 7-14-1947, and 3-29-1949. 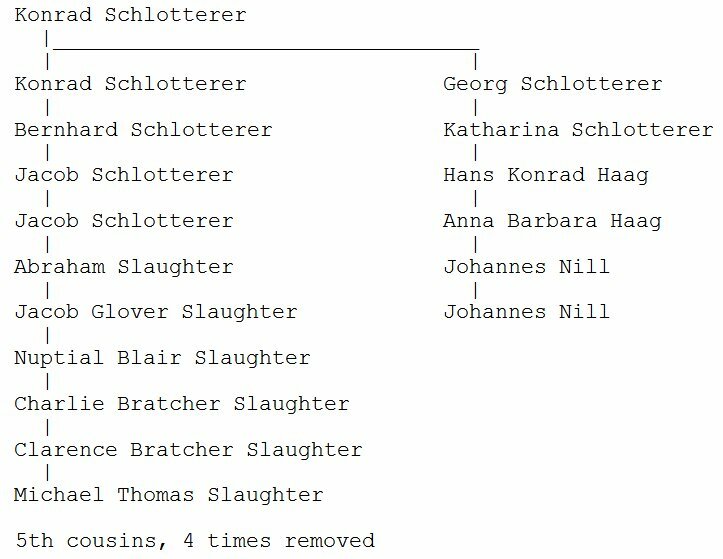 I am working on a book on the Slaughter family, the descendants of Jacob Schlotterer, who was born in 1693 in Bodelshausen, Germany and died in 1769 in Germantown, PA.
During the past year, I discovered that there is a resource in Germany that collects town records together for easy reference. It is a series of books called town family books. In German, that’s Ortsfamilienbuch. A cousin of mine, Martha Hills, emailed me that there was one of those books recently published containing the records of Bodelshausen, the village from which our ancestors came. It is called “Ortsfamilienbuch von Bodelshausen,” compiled by Hermann Griebel in 2014. Earlier this year, another cousin emailed me that she was going on a trip to Europe and would be visiting Bodelshausen. I asked her to pick up a copy of the Bodelshausen book for me. She did that, and I am now going through it and adding to my genealogy. While going through the book, I noticed that there were some family photos for some people, and there was an animal poster for one of them. I was going to just write about the book and the Slaughter research, so I searched online to find an online source for the Bodelshausen book so I could link to it in a post. There were some links to the book itself, but there were a lot of links to articles that were using the book as a reference. In particular, there were a lot of links to articles about Johannes Nill and a zoo in Stuttgart, Germany. One of the articles was a German Wikipedia article on Johannes Nill. The first thing I noticed was a copy of the same animal poster that I had seen in the Bodelshausen book. I figured that Johannes was important enough that I should write about him, and since he was in the Bodelshausen book, and I’m related to most of the families in the book, that he might be a relative as well. Here is a summary of what I found about Johannes Nill. He was born February 21, 1825, in Bodelshausen, Wuerttemberg, Germany, and died May 20, 1894, in Stuttgart, Wuerttemberg, Germany. His parents were Johannes Nill and Anna Barbara Eberhardt. You can find him in the genealogy here. Johannes was a carpenter by trade. 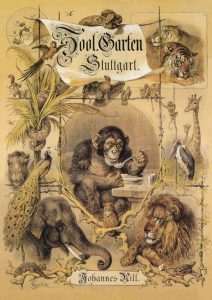 Around 1870, he bought some exotic animals, and in 1871, he opened a zoo on his property on the outskirts of Stuttgart. It was called Tiergarten Nill. Tiergarten is German for “animal garden.” At its peak, the zoo would have over 20,000 visitors on a Sunday afternoon. When Johannes died, his son Adolf took over. Eventually, the city of Stuttgart expanded until there was housing all around the zoo. People started complaining about the noise and smell. So the zoo was forced to close in 1906. 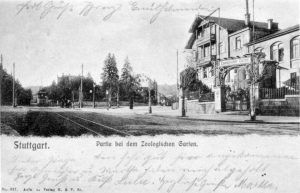 The animals were sold to other zoos, and the property was sold to the city of Stuttgart for a million marks. One of his great accomplishments at the zoo was the first breeding in captivity of the great anteater. I have decided to replace the static front page with postings about my latest genealogical discoveries and related news. Check back often and see what’s new in genealogy.